When you don’t know where to put something in your house, where do you usually store it? In your garage, until you figure out a better home for the item? While that solves your storage problem, it’s only temporary. Things pile up. Next thing you know, you forgot where you stored your luggage for your upcoming Caribbean cruise. That won’t happen anymore, though. Because we created this step-by-step guide (plus an infographic!) on how to easily clean and organize your garage. First, we’ll take you through the best ways to clean your garage floor, door, and walls. Then, we’ll explain how to organize and store your stuff in cabinets, on pegboards, and in other brilliant garage storage solutions. The advice all comes from home improvement experts, so you can trust their word. Want to embed our garage cleaning and organizing infographic on your site? 1. Soak up any oil slicks. Garage floors are especially susceptible to grease and oil stains, but you can remove them with some basic cleaners and cat litter. The pros at DIY Network and Lowes both recommend applying a layer of kitty litter to the stain first. This helps absorb the excess liquid. If you don’t have a cat, sawdust or cornmeal will do. Once you’ve let the cat litter work its magic, vacuum or sweep it up. Then attack the stain with a detergent or cleaning agent. Out of the several cleaning options that Jeff Patterson tested for Home Repair Tutor, his favorites were Trisodium Phosphate (TSP) and Drylok Etch. 2. Scrub out other stains. For all the splotches on your floor that did not come from your gas tank, try a mild detergent first. This should take care of light stains, but if you need something more heavy-duty, muriatic acid can help. Just as it does with oil spots, TSP works wonders on rust stains. Mix it with water and then scrub it into the problem area with a push broom. After it’s soaked for 10-15 minutes, rinse it all off. 3. Fill in any cracks with epoxy paste. Does your garage floor have cracks from construction projects or heavy items that fell off a shelf? Fix the cracks with a little epoxy paste. Simply fill in the gaps with the paste, wait for it to dry, and then sand the area until you’ve buffed out any extra or uneven paste. 4. Seal cracks with sealant. A sealant will help maintain and protect your garage floor. And if you’re planning to paint your garage floor, you absolutely need to apply sealant to it first. As Angie’s List explains, there are several different types of garage floor sealers. First, there’s a topical sealer. Acrylic is the cheapest topical option but also requires the most upkeep. Epoxy is more expensive but thicker and more durable. Polyurethane offers the most protection at the highest price, and you’ll need a primer to pair with this one. Then, there are penetrating sealers. These are often siliconate-based and require just one coat. For this reason, they’re the most common sealants used for garage floors. Once you’ve landed on the right option for your garage and cleaned the floor, apply the sealant like you would paint on a wall. Start in the corners and apply a healthy, even coat. Give it plenty of time to dry, so it bonds with the concrete. And if you need more guidance, pick up some extra tips from the experts at PPG Paints in the video above. 1. Brush off the dirt. Before you bring buckets of water and soap into the equation, shake down any loose debris clinging to your garage door. A stiff brush or broom should do the trick. 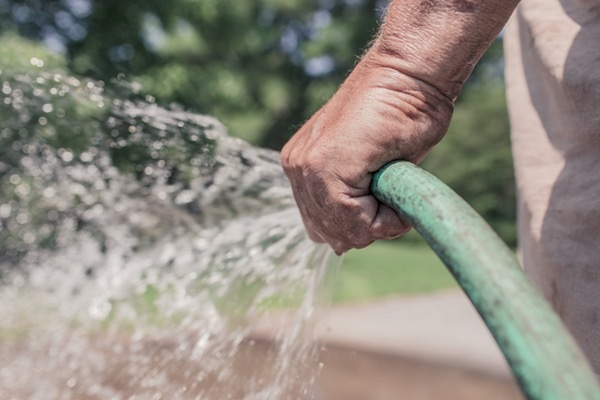 Knock out any lingering dirt with a garden hose. Give the entire door a good spray before you move onto the next step. 3. Wipe it with warm water and mild household detergent. Now comes the actual cleaning. You’ll want to have a bucket of warm water mixed with a mild household detergent on deck for this part. 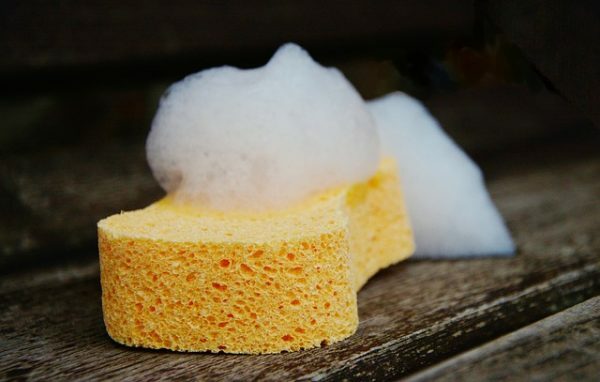 Dip a sponge or old rag into the soapy water and wipe down the door, inch by inch. Look out for splotches or stains as you go, so you can buff them out by hand. It’s just like cleaning the car sitting in your garage, minus all those pesky tire spokes. 4. Grease and tighten all the moving parts. This is a pretty quick and easy cleaning process, so while you’re at it, tune up your garage door. Check for any bent or malfunctioning pieces and use a household oil to grease every moving part. Also, tighten the screws before you close the door. 1. Vacuum cobwebs and debris. 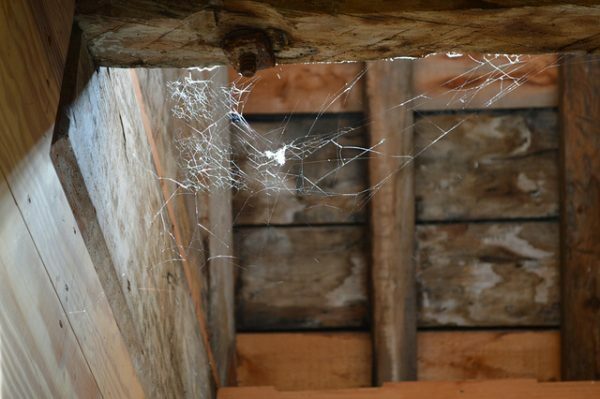 Even if you use your garage frequently, it’s a natural home for cobwebs and spiderwebs. Before you wash your garage walls, use the bristle attachment on your vacuum cleaner to remove any webs or grime lurking in the corners. 2. Sponge the walls with warm water and detergent. You’ll be doing exactly what you did to your garage door just moments ago. Take your bucket filled with warm water and detergent, grab a sponge, and systematically scrub the walls with careful strokes. You should be going bottom to top, to avoid long muddy streaks. Keep a step-stool close by so you can hit those hard-to-reach areas by the ceiling. 3. Attack tough stains with ammonia. For the spots that detergent can’t dissolve, try some basic ammonia. Mix one or two cups into a gallon of cold water to minimize the stench. Then dip your sponge in the liquid and treat each stain individually. If the ammonia can’t do the trick, Housekeeping Channel recommends trying that trusty TSP. 1. Separate everything into four piles. You should only hang onto items that make you happy. All the rest? Donate it to a charity or hawk it at a yard sale. Well, except for anything broken or useless (i.e. old newspapers). Those items belong in the garbage can or recycling bin. 2. 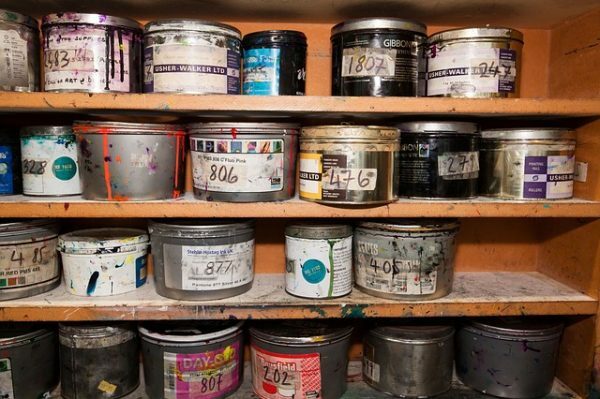 Find a new home for paint, paper goods, and propane tanks. Once you have a “keep” pile, separate out the things that don’t belong in your garage. According to This Old House, these items include propane tanks (a fire hazard best kept outdoors) and paint cans (which are ruined by extreme temperatures). Paper goods like napkins are also likely to attract bugs, and pet food might bring all the possums to your garage. Relocate this stuff to a more suitable space, such as in your cabinet or pantry. 3. Create a basic floor plan. Now that you’ve made all those cuts, it’s time to get down to the real work of organizing. This will be a lot easier to do if you sketch out or at least map in your head a floor plan for your garage. Put the bulkiest gear in the corner, where it’s safely out of your car’s way. Place seasonal items in the harder-to-reach areas, so the stuff you use all the time is more accessible. Whenever possible, keep things off the floor. Maximize your walls and ceiling as best you can to avoid crowding the floor space. 1. Consolidate items into storage bins and tubs. Don’t just throw junk onto your cabinet shelves. Storage bins and tubs can help you manage the chaos. This works best if you dedicate categories of items to specific bins and tubs. Holiday decorations can have one bin, winter clothes can have another one. Once they’re all filled up, slide them into your cabinet. Just make sure you label everything as you’re sorting. 2. Store small stuff in old coffee cans and gum containers. For the little things that would get lost in a tub, upcycle containers from your own kitchen. Lil Blue Boo cleaned out some old coffee cans to serve as battery recycling receptacles. You could easily use yours for small items in your garage. Or take a cue from The Ugly Duckling House and save old Orbit gum containers. They’re great homes for your screws, nuts, and bolts. 3. Convert a metal office cabinet into a pantry. Martha Stewart suggests getting a metal office cabinet to serve solely as a pantry. That way, you can use a magnet to attach a clipboard — with an inventory of your LaCroix, spring water, and other sundries — to the cabinet’s front door. 4. Consider a locker for each family member. Giving each member of your family their own garage cabinet might seem excessive, but what about assigning everyone a locker? Shelly at 100 Things 2 Do salvaged a set of old school lockers, repainted them, and then gave herself, her two daughters, and her husband one unit apiece. Each person could then sort their helmets or sidewalk chalk to his/her liking. Shelly found the lockers in the Canadian classifieds, so keep an eye on Craigslist or The Container Store for your own set. 1. Mount toolboxes on the wall. He bolted his toolboxes to his garage walls and mounted a few metal tool cabinets high up near his ceilings. This garage organization system keeps his floor empty so he has more room for tune-ups. Even if you’re not a motorhead like Bernie, this approach can also help you save space in your garage. 2. Store garden tools in a converted filing cabinet. Turn an upcycled filing cabinet on its side and you’ve got a great home for your rakes, shovels, and mops. As The Milwaukee Journal-Sentinel illustrates, all you have to do is remove the cabinet’s drawers and slot your tools into the empty space. 3. Build a portable tool caddy. Your tools make life so much easier. Return the favor by building them a tool caddy with these instructions from Mom 4 Real. 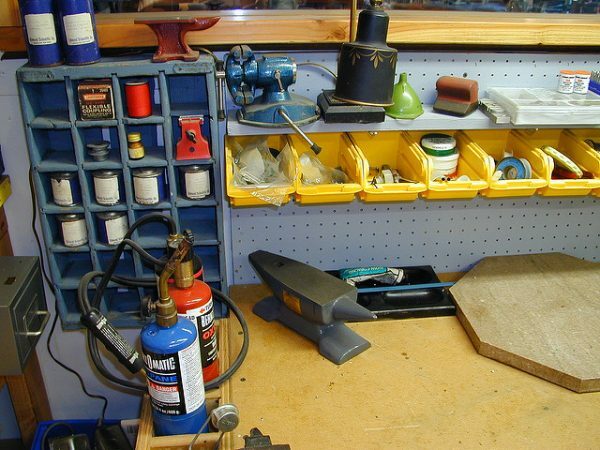 This DIY garage storage project requires wood, pegboards, a saw, screws, glue, and casters. Once you’re done building it, you have a movable one-stop-shop for all your tools. 4. Outline your tools on the wall. It’s easier to keep track of your screwdriver when it’s literally drawn on the wall. When hanging up your tools, carefully trace an outline around each one with a pencil. Then, take down the items and make the sketches more visible by going over each sketch with a marker or paint pens. When you’re done, put your tools back in their (now very clearly) assigned spaces. Garages sadly don’t come with built-in pegboards, so before you can organize one, you need to set it up. For this project, you’ll need a tape measure, screws, a drill, an actual pegboard, and a few other items to mount it. 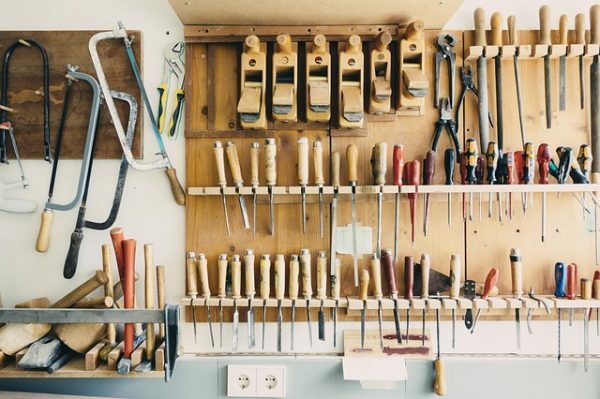 Bob Vila lays out the process in five steps here, but if want a more dynamic tutorial, watch the above demo from Frugal Home DIY. Once your pegboard is all set up, you’ll need to install some hooks so you can actually hang things. Hooks can easily slip off their slots after you attach them. Which is why The Family Handyman recommends locking them in place with zip ties, pegboard clips, or some hot glue for extra security. 3. Use baskets and bins. Small wire baskets and pegboard bins can help you store items that don’t easily fit on a hook — think stud finders and loose screws. Check your local Home Depot, Staples, or Sears for these accessories. 4. Or skip the pegboard and let MakeSpace store your stuff. Still have stuff that won’t fit in your garage cabinet, on your shelves, or on your new pegboard? We’ll store it for you. All you have to do is schedule a MakeSpace pickup, pack your stuff, and leave the rest to us. We’ll pick up everything (including your bulky snowboard, skis, sports equipment, and appliances) and store it in our secure temperature-controlled storage facility. We’ll also create an online photo catalog of your stuff so you always remember what you have in storage. When you want something back from storage, simply log into your MakeSpace account, select the item’s photo, and we’ll deliver it to you. It’s that simple.